Three years of Sundance, and I finally made it to the movies! 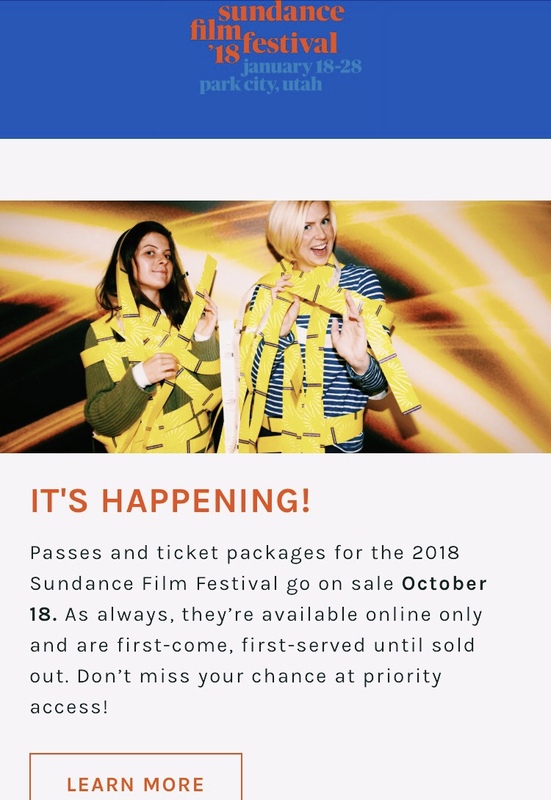 I want to share my experience buying tickets, registering for films, and navigating the festival, because I don’t think it’s a particularly simple process and there wasn’t very much content written about this last year. Hopefully, by the end of this, you’re feeling prepared and catching that SUNDANCE FEVER!! First-half tickets + passes generally sell out first, and second half tickets + passes can be significantly cheaper depending on what you buy; two things to consider as you figure out which weekend to go. Everything is on sale until sold out so I suggest making a note in your calendar as soon as the sale date is announced and just get the purchase out of the way. Compare each level of package + pass prior to purchasing so that when it’s time to buy, you already know exactly what you’re putting in your cart. The biggest difference I saw between package and pass was about $900 and the luxury of having priority. As of now, I do not think the price for a pass is worth it, and in fact, I find the mystery and anticipation of not getting into every film exciting and part of the festival experience. The easy part is done, you've bought your tickets! It’s a whole thing; I’m going to tell you that right now. My first time ended in tears and then pure bliss when I was able to get into the one film I was dying to see. Simply put it was a stressful process; I’m aiming to make your experience seamless so let’s get down to it starting with how to avoid disaster. Go over the festival schedule before it’s your turn in the cue, go over it before that day comes, in fact, plan your schedule as soon as the line up is released, and then write it all down. Write down the day and time of everything you want to see in a way that you will be able to easily read it because as soon as it’s your turn, the clock is ticking. That brings me to my first mistake: I didn’t take the showing times seriously because I was surprised by how many films weren’t playing the first half so I assumed this was something that would change. It didn’t change, it’s real, and it’s another reason I’m considering going the second half next year. My second mistake: not putting tickets into my cart straight away, and this is exactly why I didn’t get to see STUDIO 54. It played once while I was there and I had two tickets in my possession but I was afraid that if I added them that it was automatic and I wouldn’t be able to change my mind, and what if there was another movie on Sunday morning I wanted to see more?? Well it isn’t instant confirmation, they sit in your cart and you have about 20 minutes to decide if you really want them, so by the time I realized this it was too late for me and STUDIO 54 was beyond sold out. So sold out that when I registered for it on the waitlist 400 people made it on before me, the struggle is real. The third mistake I made: I kept going over the schedule maybe three or four times while I was in it and by the third time I realized everything was selling out, hence the tears of frustration. The fourth and final time around I noticed that some tickets were available again, then the happy tears came when I snagged two tickets to COME INSIDE MY MIND at 8:30AM, slim pickings but very worth the early morning. Learn from my mistakes, know your schedule, add all the tickets to your cart and make up your mind later. At the end of the day, some things are just going to sell out before you even log in, in my case that was WILDLIFE and THE TALE. The check-in process was easy; I did it on Wednesday night before the lines were crazy. The box office is just around the corner from Patagonia on Herber Ave, and if you already purchased and registered online then you head upstairs to pick yours up. If you’re purchasing tickets onsite or looking to exchange then you go downstairs, I did this for the film I saw on opening night when I found out Brando wasn’t going to make it in time. It was $2 to do the exchange and I was given another voucher in its place. You can exchange your tickets up to two hours before the film starts; this brings me to another hard lesson learned. If you miss your film for any reason you can’t exchange it for a voucher. Like the time Brando drove us to The Library to see COME INSIDE MY MIND and they told us we weren’t allowed to park there, he missed it because he had to go find parking (the best friend ever though). When we went to exchange the ticket, they said it was too late, $65 lost just like that. I was also told that I couldn’t exchange tickets if I didn’t get into the theatre due to it already being full of press and pass holders. We learned this while we were in the waitlist line for WILDLIFE, ticket holders weren’t even getting in and were told by staff that they too were out of luck. This is something that is advertised as a great alternative to buying tickets and is also my understanding that it has evolved a lot over the years. The biggest difference is that you can do everything online now, so no more standing outside in the snow for five hours trying to see a film. Still, take it from my first-hand experience that if you’re serious about seeing movies then do not rely on the waitlist. Whatever you don't register for is turned into a voucher and these can be used as payment for anything you get into on the waitlist. The waitlist can be accessed via the Sundance app, it has its own tab so it’s easy to find. Exactly two hours before each film starts, the waitlist opens up. My first tip is to set an alarm, Brando and I both set ours about two minutes before each list opened. Click on the movie you’re trying to see, it brings you to another page with a countdown, as soon as it’s officially open you will be able to click to enter the waitlist. It’s a total adrenaline rush really, waiting 15 seconds to see if you made it on or not. You’re either given a number or you’re not, and the best part is you can enter the list with a friend as long as you link accounts which doubles your chances of getting on; there are easy instructions on the app regarding how to get connected. At first, the waitlist seemed simple when we registered for AMERICAN ANIMALS and made it on as 13 + 14 in line but we were having so much fun at the YouTube house that we lost track of time and decided to cancel. Well, everything changed when we tried to register for THE CATCHER WAS A SPY that night and then we saw the dark side of the waitlist, out of 400 people neither of us made it on. After trying the waitlist about ten different times over the course of our stay, we finally found success on Sunday afternoon when we registered for JULIET, NAKED playing at The Grand Theatre in Salt Lake City. Don’t be afraid of SLC! It was a nice change of scenery, and it was much easier getting through on the waitlist here than in PC. You show up and check in with staff holding an iPad and they show you to the line, depending on your number is where you stand, so since we were 10 + 11 we were able to cut most of it. Some people no show so you get bumped up, and sometimes people hand tickets out for free so that can help you move up too. Both of those things occurred while we were in line so we were 6 + 7 by the end of it. Once everyone settles in, the waiting game begins. After they let all ticket holders in, they count how many seats are still open, if any then they start letting waitlist in. As nerve-wracking as that experience was, it felt like such an accomplishment to make it into that theatre! Fun fact, we were seated next to the director, another reason I love Sundance, it’s full of surprises. By the end of the weekend, we had four tickets leftover, which was disappointing but I still feel this was better than investing in a pass. o If you’re truly a fan of film or even just intrigued by all the buzz, you should absolutely consider going to Sundance! My first time fell into my lap and was driven by pure curiosity, now I would say I’ve fallen in love with independent storytelling which is what draws me back every year. o Don’t go alone, I almost did and I don’t think I would have had nearly as much fun as I did with Brando. It can be surprisingly hard to find friends willing to invest in a trip like this so don’t just do movies! Do snow sports, and smores, there’s something for everyone in Park City. o The theatre page is going to be very helpful throughout the festival; it shows you about how many people they let in from the waitlist on average, the address, and parking rules. Often times we would remove ourselves from the waitlist if the chances were clearly slim based on the average alone and if we were moving up at all within the last hour. o Waitlist or not, don’t be late to your movies!! When they ask you to be there before a certain time, give yourself extra time to get there because otherwise, you’re risking losing your seat even if you already have a ticket. o Seeing a film at the Egyptian is a must, we saw a really edgy one on our last night called PIERCING and it just felt like all my Sundance dreams were coming true. I am a full time social media manager but more importantly I am a creative (content creator, blog writer, sometimes model). When I’m not at the office I’m blogging/vlogging about all things globe trotting, luxury travel and living in LA.